When Wisconsin Governor Scott Walker announced that he would use his upcoming budget to expand private-school voucher programs, even some Republican legislators objected. 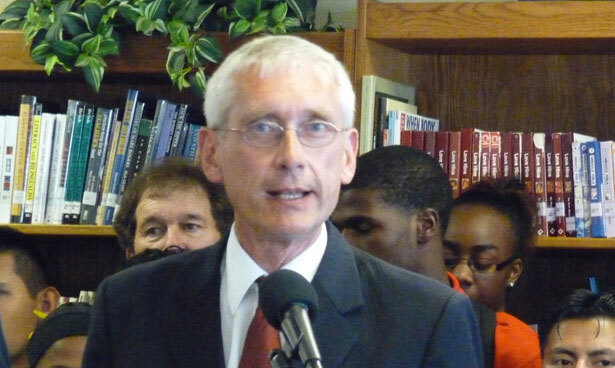 Complaining that the previous Walker budget had cut $1.8 billion from public schools, Evers argued that it was wrong for the governor to use his 2013-15 state budget plan to essentially freeze public school funding while hiking spending for private voucher school students by as much as $1,400 each. Staking out so clear a position in opposition to the governor’s agenda—not just on vouchers but on a host of education policy issues—was risky. Evers was up for reelection and he faced a determined challenge from Republican state Representative Don Pridemore, a steady supporter of Walker’s legislative agenda. The governor did not make an endorsement in the nonpartisan race and that miffed Pridemore, one of the most conservative members of the legislature. But the challenger's campaign was cheered on by the Republican Assembly Speaker, conservative radio hosts and activists. A well-regarded and easy-going figure, Evers could easily have mounted a cautious campaign for the statewide post. Instead, he campaigned across the state prior to Wisconsin’s April 2 statewide election with a message that Walker’s voucher scheme posed a threat to public education. Voters responded by giving Evers a 61-39 victory statewide. Lisa Subeck, the executive director of the progressive grassroots group United Wisconsin argued that the election results should cause the governor to rethink. The governor may not waver. His positions are popular with conservative advocates at the national level, and it is no secret that he’s pondering a 2016 presidential run. But Republicans legislators, especially in the state Senate, have already raised concerns. Indeed, Senate President Mike Ellis says that a number of Republicans find the governor’s proposal “unacceptable.” Ellis says Walker’s proposal will be "drastically changed" during the budget debate. How drastically remains to be seen. But Republican legislators who were disinclined to go along with Walker on the voucher issue—and the broader education-funding debate—will take comfort from the fact that, in a “stark choice” election, voters gave overwhelming support to the candidate who was outspoken in his defense of public education. The antidote for education shock therapy? Read Rick Perlstein's take.